Image license CC0 by amurca. Portugal’s second largest city is known all over the world as the birthplace of a rather sweet dessert wine. In fact, Porto gave its name not only to the port wine, but to the country of Portugal itself. Apart from its still thriving port wine industry, Porto is a beautiful and stylish city with a spectacular setting in a gorge carved out of the River Douro. The production and distribution of port is still a vital part of the city’s economy and is what draws many visitors to this part of Portugal. A good place to start your visit to Porto and educate yourself about port is at the elegant Solar Vinho do Porto, a sort of showcase for the industry. The institution is housed in an elegant 18th-century villa and offers tasting samples of every variety of port produced in the country. There is also a small museum dedicated to port wine, located in a warehouse once used for storing barrels of port. 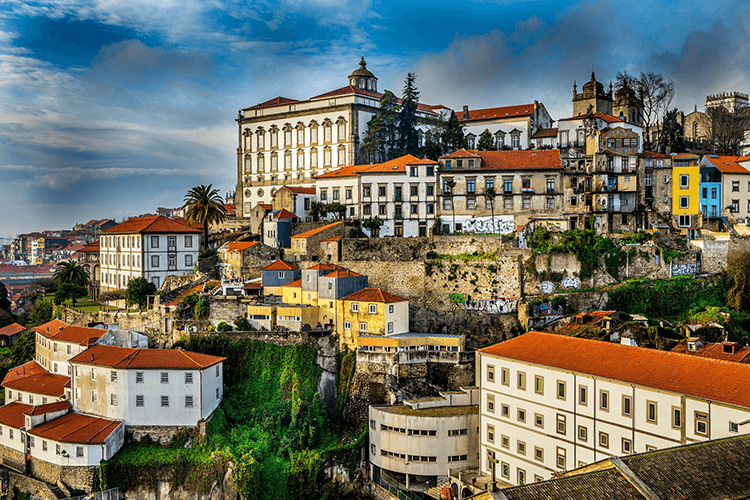 The suburb of Porto known as Vila Nove de Gaia is where some of the most famous names in port have their headquarters, or lodges as they are known. Nearly all of them offer free guided tours, a chance to see behind the scenes and of course, to sample the product. Among the well-known and historic names here are Sandeman’s and Taylor’s, which is the last of the original English port companies to remain family-owned. A tour of any of the lodges always ends with a glass of port served on the terrace overlooking the river. One of the best tours is of the Ramos Pintos lodge, which offers not only the usual tour of the port cellars but also a visit to the elegant corporate offices, decorated with beautiful furnishings from the 19th century. Porto offers more than just the wine that made it famous. The center of the city still retains much of its medieval atmosphere, with narrow and hilly streets, and walking is the best way to see the city. The cathedral in the oldest part of the city, the Cathedral Quarter, is well-known for its mixture of architectural styles ranging from Romanesque to Gothic and for its lovely altar built entirely of silver. There are several other beautiful churches in this area worth exploring, including the lovely Church of St Clara, the interior of which is full of elaborately carved woodwork. Not far from here is a thoroughfare considered the most romantic street in the city, the Street of Flowers, with its many silversmith’s shops and wrought-iron balconies. One of the most fascinating central neighborhoods is the old working-class area of Ribeira, which is a labyrinth of narrow streets and alleyways, many lined with small balconied houses and family-run shops and bars. Gentrification has crept into parts of Ribeira, and as a result, the area offers several more trendy eating and drinking places. The part of Ribeira that borders the river is a great place to eat and drink in one of the many inexpensive seafood restaurants lining the waterfront. If the impressive nearby iron bridge over the Douro looks familiar, that is because it was designed by a colleague of Gustave Eiffel’s. Shopping in Porto ranges from elegant department stores and designer boutiques to street markets specializing in caged birds and potted plants. The city also has many fine jewelry stores, a reminder of the days when precious stones and gems were brought to the city from every corner of the mighty Portuguese empire. There are also several places where you can buy colorful hand-woven Portuguese carpets, a distinctive reminder of the region. An easy day trip from Porto is to the popular beach resort of Espinho that is so close to Porto, it’s virtually a suburb. Espinho offers plenty of beaches and nightlife, including a casino. Its also something of a destination for sports enthusiasts, offering water sports, bullfighting and golf on the second oldest course in continental Europe. A good place to have a memorable meal in the city is at the historic and atmospheric restaurant called Barao Fladgate. The restaurant is owned and operated by the Taylor port company and is set in a walled compound high above the Douro River. The menu offers traditional Portuguese dishes served by formally dressed waiters along with a spectacular view over both the river and the city. It’s not only an excellent dining experience, but an excellent way to round off a visit to this fascinating and historic city.